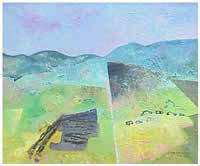 Joan Abrahams has paintings in private collections in countries around the world. Her paintings are also to be found in corporate collections. She works in watercolour, gouache and ink as well as in acrylic and oil. She has had several shows, both locally and in the UK. Paintings in corporate and private collections in UK, Canada, Israel, Australia and South Africa, e.g. Alexander Forbes Head Office - Umhlanga; Rand Merchant Bank. 2000 - Exhibition entitled 'Africa, My Africa" at the NSA Gallery, Durban. Some of these works (watercolour, ink and gouache on paper) were exhibited and sold in London, UK. 2002 - Carol Lee Exhibition, entitled 'Inside Out' at Upstairs @ Bamboo, March, 2002. Oil on paper. 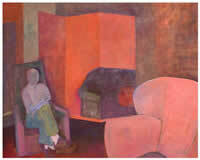 2002 - Exhibition of works including:- oil on canvas, oil on paper, 56X76cm; oil on board constructions and paintings in watercolour, ink and gouache, at Merely Mortal, Johannesburg, April/May 2002. 2002 - Invited by 'The Art Space' to exhibit paintings at the JOWSCO (Johannesburg World Summit Company) offices in Sandton, Johannesburg, during the World Summit on Sustainable Development.